Even though last week's menu plan didn't go completely as planned, it felt good to have some sort of plan in place when the dinner hour rolled around. Especially, since this past week was busier than usual. This week, I have plenty to keep me busy around here, though, it will be slightly less hectic. We'll be preparing meals from our over-stocked pantry again this week. In hopes that soon I'll be able to fully close the doors on the pantry cabinets. Hot dogs, mac 'n' cheese. Not a very healthy, or even creative meal, but we have some buns that need to be used. Enchiladas. Last week, I made enchilada filling using some leftover Zesty BBQ Chicken. Even though it was just a small container of chicken, adding some cooked rice, a can of beans, some cheese and canned chilies, really bulked up the filling so much, I had enough filling to freeze for this week! 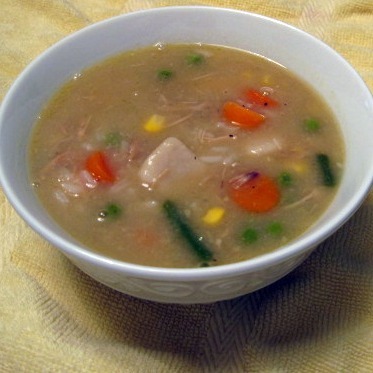 Chicken 'n' Dumpling Soup. On Sunday, I made Chicken 'n' Dumplings instead of Chicken Pot Pie. I was really in the mood for pot pie, but forgot to pick up the butter needed for the recipe we stopped to get milk and bread last week. That's okay, though, since we'll get another meal from the dumplings when I turn it into a soup. Applesauce Chicken, sweet potatoes, green beans. 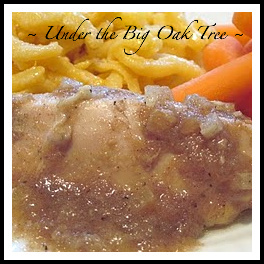 Keeping up with the "easy" theme of the week with this simple crock pot chicken recipe! Hamburgers, baked beans, corn on the cob, salad. The holiday weekend calls for summer barbecue type foods. While I'm really looking forward to soup and stew season, I'm always up for a big, juicy burger! Mmmmm! I love planning my menu but I've felt stuck after having just come back from vacation. I need to get back into it!